There are days when you just don’t feel like putting much of an effort in cooking and if you’re having one of those days then try making these simple and easy hashbrowns. Also do feel free to add your own ingredients to experiment with and give this dish your signature. Any cooked meat (salami, sausages, chicken, turkey, etc) chopped up. This is optional. Put the grated potatoes in a mixing bowl and season with the salt, pepper, herbs and some grated cheese in the mixture. If you are using the meat add it into this mixture. Make sure the pieces are chopped up small. Mix gently and fashion the mixture into patties. Spray non-stick pan with oil and place these patties to cook on low heat. 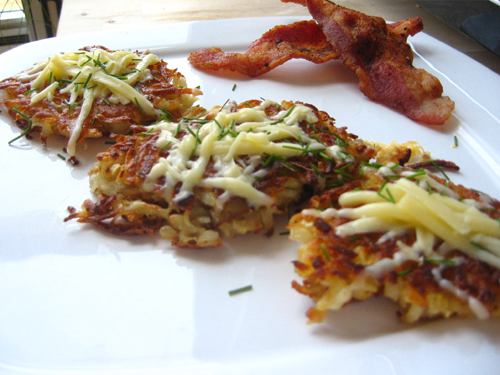 Add some more cheese on top before putting on the pan’s cover to allow the hashbrowns to cook with the steam on top. Make sure you use a spatula to loosen the patties from sticking to the bottom of your pan as you will only allow one side to cook. Remove cover and serve with baked beans, bacon and sunny side up eggs for a lovely Sunday brunch or even at any mealtime. Feel free to experiment with mushrooms finely chopped into the grated potatoes instead of the meats for a vegetarian option or even sweetcorn kernels. They’re yummy if you ‘spray the tray and grill too’! Grilling sounds fab! Is it a flame grill or electric grill? You can also bake at 180 degrees Centigrade for 15 minutes. Let me know how your breakfast goes. Kamal you are a genius!! I’m borrowing this to er experiment on my unsuspecting friends. I hope I dont disappoint you! I’ll tell you how it goes. thankx kamal for dis wonderful recipe im gonna make it for sundays breakfast… U hv saved me.. Bless yu. Thanks so much. Would love the feedback on the recipe and also if you added your own signature to the dish. I have mosre easy recipes I’ll be uploading shortly. Watch this space…. !